Hypothyroidism is a condition in which the thyroid gland does not make enough thyroid hormone. This condition is often called underactive thyroid. 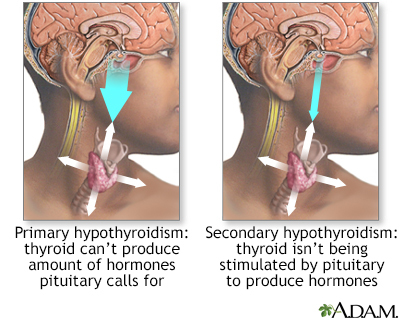 The most common cause of hypothyroidism is thyroiditis. Swelling and inflammation damage the thyroid gland's cells. Blood tests are also ordered to measure your thyroid hormones TSH and T4. Treatment is aimed at replacing the thyroid hormone you are lacking. You will be prescribed the lowest dose possible that relieves your symptoms and brings your blood hormone levels back to normal. If you have heart disease or you are older, your doctor may start you on a very small dose. Most people with an underactive thyroid will need to take this medicine for life. 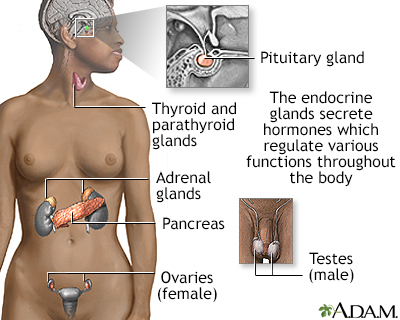 When starting you on your medicine, your doctor may check your hormone levels every 2 to 3 months. After that, your thyroid hormone levels should be monitored at least once every year. DO NOT stop taking the medicine even when you feel better. Continue taking it exactly as your doctor prescribed. If you change brands of thyroid medicine, let your doctor know. Your levels may need to be checked. What you eat can change the way your body absorbs thyroid medicine. Talk with your doctor if you are eating a lot of soy products or are on a high-fiber diet. Thyroid medicine works best on an empty stomach and when taken 1 hour before any other medicines. Ask your doctor if you should take your medicine at bedtime. Taking it at bedtime may allow your body to absorb the medicine better than taking it in the daytime. Wait at least 4 hours after taking thyroid hormone before you take fiber supplements, calcium, iron, multivitamins, aluminum hydroxide antacids, colestipol, or medicines that bind bile acids. In most cases, thyroid hormone level becomes normal with proper treatment. You will likely take a thyroid hormone medicine for the rest of your life. Myxedema coma is a medical emergency that must be treated in the hospital. Some people may need oxygen, breathing assistance (ventilator), fluid replacement, and intensive-care nursing. Call your provider if you have symptoms of hypothyroidism. Hypothyroidism is a decreased activity of the thyroid gland which may affect all body functions. The rate of metabolism slows causing mental and physical sluggishness. The most severe form of hypothyroidism is myxedema, which is a medical emergency. 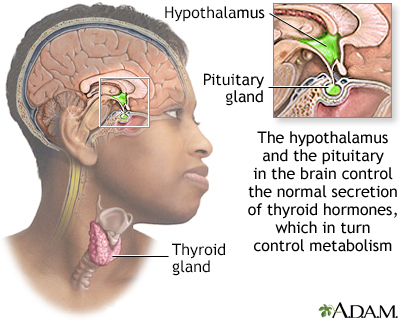 Although the thyroid gland releases the hormones which govern growth and metabolism, the brain (the pituitary and the hypothalamus) manages the release and the balance of the amount of hormones circulated. 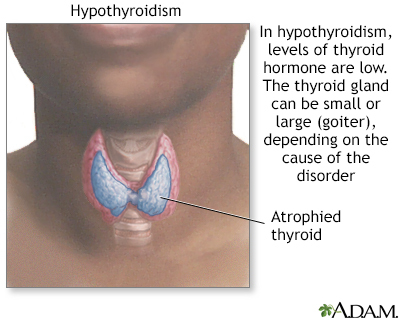 Hypothyroidism is a decreased activity of the thyroid gland which may affect all body functions. The rate of metabolism slows causing mental and physical sluggishness. The most severe form of hypothyroidism is myxedema, a medical emergency. Hypothyroidism can be caused by a problem with the thyroid itself (primary), or by the malfunction of the pituitary gland or hypothalamus (secondary).